BEGINNINGS. Beaufort, SC, attracts retirees from many areas. By late 1998, several retirees with Unitarian Universalist backgrounds became acquainted, and the idea of forming a congregation became increasingly attractive. UUFB’s founding mothers first met around a kitchen table in the beautiful retirement community of Dataw Island in northern Beaufort County. They soon gathered others with liberal religious outlook, including a Presbyterian minister who began attending the publicly announced organizational meetings. Within a few years, this minister would transfer her ordination, and through much dedication, become the fully fellowshipped UU minister at UUFB. The first organizational meetings in January 1999 took place in the fellowship hall of downtown Beaufort’s historic Beth Israel Synagogue, then moved to an events building, The Shed, in the nearby township of Port Royal. In these early days, meetings were held with chairs in a circle, open-discussion style, sometimes facilitated by the district executive, more often by an appointee from the UU Church of Savannah, Ga, a Beaufort native with a long interest in seeing a UU congregation established in Beaufort. On March 7, 1999, the group held its first formal worship service in a dance studio room at The Shed. The chairs stood in neat rows, the first printed Order of Service was available, and a planning meeting was set to commence after worship following a ten minute break for coffee and cookies. The announcement section identified congregational areas for development in the near future. A focus on justice was not on the list! Yet in the room were many longtime UUs with justice experience. Their justice leadership would soon become important as the congregation achieved its early goal of recognition by the UUA in October of 1999. CHOICES. The gratifyingly quick recognition from the UUA provided a jump-start for increased fund raising because early generous gifts had “charitable donation” status. As supportive money came in, the question arose: which comes first, ministerial leadership or property ownership? High quality Sunday worship services, with professional leadership as often as possible, was more important to the UU retirees as well as the younger like-minded congregants. The interest in property ownership stayed alive as the dance studio became crowded with attendees. As the congregation grew and children attended, a move was made to a larger meeting space at the nearby U.S. Naval Hospital’s social facility. It was here that the Religious Education program for children began, the choir formed with determination to improve congregational singing and other musical experiences, and UUFB’s justice history began in earnest. 178 SAMS POINT ROAD: FIRST TRY. A third move to a rental space at 178 Sams Point Road, the Sea Island Conference Center, offered UUFB the opportunity to experience worship in a more appropriate setting—almost! Originally built as a small evangelical church visible from a main road on Lady’s Island, two miles from downtown Beaufort, the property contains a small sanctuary, a room suitable for Religious Education, and a pleasing wooded environment on 3 acres. The first meetings of a meditation group, practicing in the tradition of Thich Nhat Hanh, became connected with UUFB while it met on this third rental property. The first offer of part-time ministry to the former Presbyterian minister was approved, and the minister accepted. Sadly, it soon became time to move again because the conference center was rented to several other entities, and its usefulness to UUFB was compromised by the state in which it was often found on Sunday mornings. Quiet inquiries to the owner about a UUFB purchase of the property were disappointing, so UUFB moved to the YMCA, back once again to the Port Royal area. THE YMCA: YEARS OF DEEPENING AND GROWING. During the YMCA years UUFB gathered much strength; the minister brought in more members and helped shape better practices in governance and other areas of congregational life. New retirees continued to join and quickly became active while other aging members were lost to moves, infirmity, and death. Several strong young families were welcomed. They brought beloved children with liveliness, humor, and energetic attitudes. These are the years of the first paid infant/toddler child care staff, the first process observation for meetings (2005), the first policy for congregational emails (2005), the firstCovenant for Congregational Meetings (June 2006), the first Code of Ethics for Adults and Older Youth Working with Children and Youth (December 2006) the first UUFB Mission Statement (2007), and the Long Range Plan that challenged UUFB to renew and strengthen the ties of history and justice to Penn Center on St. Helena Island. In 2007 there were 50 signed members, over $70,000 in a reserve fund, a balanced annual operating budget of $54,000, and as of July 1, the now fully fellowshipped UU minister serving at three-quarter time. In 2007 the first purchase of church furnishings took place as UUFB moved Sunday worship services into a much larger empty room at the YMCA. Although the building was occasionally available to UUFB for meetings beyond Sunday morning and board meetings, private homes were the consistent venue for committee meetings, choir practice, and potluck dinners. While a family feeling was strong as UUFB met at the YMCA, the desire for property ownership grew ever more tangible. The minister and board promoted property search efforts, and the minister repeatedly reminded the congregation to keep UUFB’s mission in mind, and to avoid allowing property ownership and its many attendant concerns to “become the mission.” In 2008, the UUFB Long Range Plan promised to “renew and recommit to the historic UU connection to Penn Center, and in January 2009, the annual operating budget had a justice line item approaching 10% of the total budget. THE STORY OF “THE OAKS” PROPERTY. In the summer of 2009, UUFB purchased its first land, beautiful acreage on St. Helena Island. The property was once attached to the antebellum home used by Unitarian Laura Towne in 1862 as the first school for the newly freed people of the island. For many years the property had been “heirs’ land,” transferred through the ever-widening family lineage of freed people who came to own the land after having worked it for generations of enslavement. The title to the land had been “quieted” long ago by family members who sought to have land held in common divided fairly among the living heirs, with clear title for all. Assured of clear legal title, and after affirming with family members that all was well to proceed, UUFB bought the land and began plans to modify the existing residence into a new meeting space. Soon board meetings and other meetings were scheduled on the new property. Arriving for a meeting late one afternoon, board members were startled to discover a note left by a family member who was visiting from out of state, and who strongly objected to the sale of the land. For details on this important piece of our history, see the personal narrative by founding UUFB member Jim Key. Soon UUFB would begin anew the search for property. TENTH ANNIVERSARY. 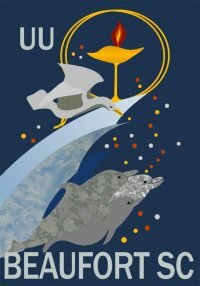 On November 1, 2009, UUFB held a public worship service in celebration of 10 years of existence. Activities took place in the open air pavilion at the Waterfront Park in downtown Beaufort. The theme was “Shall We Gather by the River” as the minister and others spoke and a guest musician provided special music. 178 SAMS POINT ROAD: SECOND TRY. In early 2010, to UUFB’s surprise, the Sams Point Road property, the previously short-lived rental site, became available for purchase. With many congregants already familiar with the site, the decision to purchase was uncomplicated. Ownership of one acre and two buildings was accomplished by the end of August 2010, with two wooded acres held under contract for purchase two years later. After several months of refurbishing, UUFB happily moved to the 178 Sams Point Road address in March of 2011. Membership had grown to 81, and at June’s General Assembly, the UUA recognized UUFB as a Breakthrough Congregation. ADJUSTMENTS, CHALLENGES, SUCCESSES. The early days of property ownership created a need to further align governance and policies with new conditions. Board and minister worked diligently to balance new property responsibilities with mission and the expanding interests in uses for the property. The board approved a process for the establishment of affinity groups through covenant between minister, board, and group. Three affinity groups were quickly formalized: Earth-Centered (later named as Ancient Sea Island Continuum, “ASIC”), Buddhist, and Christian. Careful review and shaping of policies were and are ongoing. New committees dedicated to property upkeep and rental formed; longtime committees expanded their activities to take advantage of the new environment. Financial stresses occurred with the mortgage payments as the realities of property ownership stretched the operating budget. In response, successful yard sales and annual service auction fundraisers were held, along with more modest and equally successful collections. Justice programs expanded and a policy for justice funding was developed and refined by the Social and Environmental Justice Committee. A Welcoming Congregation Committee was begun. The minister agreed to accept a full-time position. In May 2013, UUFB was honored to be inducted into the Penn Center 1862 Circle at its annual Gala. The minister gave a moving and deeply felt acceptance speech, singing with her beautiful voice to the crowd of over 450 attendees. UUs from afar came to celebrate with UUFB at the Gala. The ties and activism related to Penn Center continued, and justice activism grew under the leadership of a retiree skilled in organization and inspiration. A TIME OF SORROW. To the great sadness of UUFB, the minister announced in January of 2014 that she would resign effective June 30, 2014. Her successful ministry to UUFB as the only called minster had lasted twelve years. The celebrations honoring her were curtailed by the sudden death of a UUFB teenage family member whose life of dedication, purpose, and maturity were known to all. The unexplained death of a vibrant and seemingly healthy youth shocked the congregation into a period of deep sorrow. Already mourning the tragic loss of several older members within recent months, as well as losing 14 members, including two children, to moves, the grieving congregation felt lost. With the longtime minister’s imminent departure, and the interim minister not to arrive immediately, a miracle of generosity emerged from a sister congregation in Virginia. A visiting minister came to support UUFB in its grief. With counseling, the leading of a mid-week service of healing and comfort, preaching, caring, and a workshop facilitation, the visiting minister offered stability in the midst of UUFB’s unhappiness. She bridged the days between the settled minister’s departure and the interim’s arrival, a selfless gift that will be long remembered. HOLDING JOY AND SORROW AS ONE. On August 1, 2014, a 2-year interim ministry began, and the kind leadership of a new and interesting ministerial personality began the transitional period. UUFB’s governing board and congregation quickly and joyfully welcomed the talented and cheerful interim minister. Workshops appropriate to the interim period commenced. Good humor, laughter, and optimism tempered the flow of loss and sorrow. New Bylaws, long in development, were approved in November of 2014. In the year spanning April 2014 to April 2015, 28 new members joined the congregation, bringing the total membership to 99. During the summer of 2015, a brief “Summer Surge” capital campaign gathered in enough extra funding, including reserves, to proceed with confidence to renovate the back building. In October 2015, UUFB celebrated a “Sweet Sixteen Founders and Finders” Dinner, an annual tradition remembering the founding mothers and honoring the vitality that newcomers bring to the table. TASKS IN PROCESS AND MOVING FORWARD. By fall of 2015, contracts were ready to begin improvements to the back building. The back building is to become the new sanctuary, with the front building housing the fellowship hall, the not-so-private minister’s office, and Religious Education room for children. The front building will retain its kitchen and 3 restrooms, one of which is gender neutral. Plans for the back building show the addition of a large greeting room with a wrap-around covered porch designed to take advantage of the pleasant climate, a third accessible restroom, a social patio, and grading so that all entries are accessible without steps. An infant/small baby room will be available, improved windows, doors, and new flooring are intended, a much needed new heat and air system will be installed, and a fine grand piano, anonymously donated, awaits the new sanctuary. A Ministerial Search Committee and a Right Relations Process Task Force are on task in the late fall of 2015. Hopes are high to attract a new settled minister who will be happy in the beautiful coastal environment where UUFB serves out its mission. A flame within a chalice (a wide-lipped stemmed cup), is a symbol of the Unitarian Universalist (UU) faith. The flaming chalice image has changed many times over the past 65 years. There is no single interpretation of today’s flaming chalice symbol. Modern chalice designs often incorporate two overlapping circles which, for many people, represent our Unitarian and Universalist heritages. 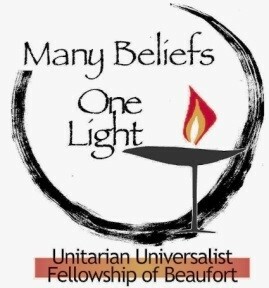 The UUFB symbol, which incorporates the words “Many Beliefs One Light” and our name, was created by a group of members who got together and brainstormed ideas for both the design and the words and then had it digitized. Read about Unitarian Laura Towne and her 1862 Founding of Penn School on St. Helena Island.